It's designed for systems that will go into media rooms, bedrooms, dorm rooms, or any place where both silence and performance are essential. 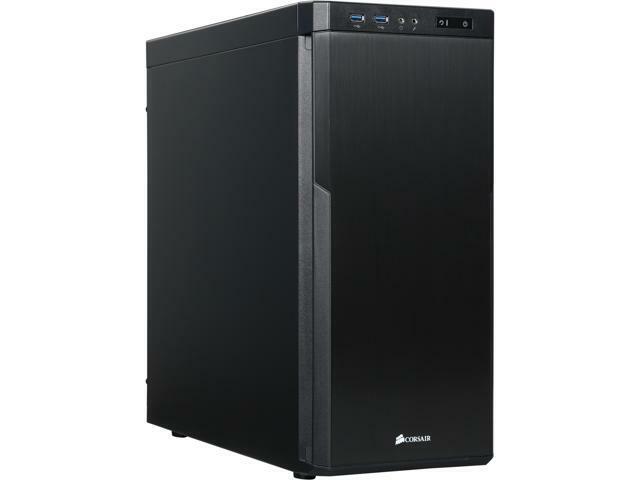 Sound damped doors and panels and clever intake fan design are combined with generous expansion room and builder-friendly features to allow you to build a silent PC that can pack a lot of power for gaming and high-definition media streaming. 19.49" x 8.27" x 19.06"
Pros: Very quiet fans, professional appearance, rounded edges inside, great cable management options, easy adjustment path for advanced cooling if needed. Filters easy to remove and clean. Cons: Plastic door hinges look like a weak point. Door unfortunately also closes on a plastic peg rather than using magnets. Other Thoughts: For the price, one of the top cases for professionals using ATX boards. Pros: -build below. everything fit nicely. -MOBO and Radiator were really close together giving some issue to plugging in the cpu power cord. -cooling is great, it pretty quite. obviously if you have the fan switch turned up all the way it is a little noise-y. Cons: -biggest complaint is with the front swinging door. The little clips pop out from time to time when opening, even gently. -grommets for power cables would be nice, would help really give it a clean look. Pros: Absolutely love, very quiet case. Ease of use and ease of understanding. If you have tech knowledge, manual is actually unneeded. Completely disassembled and reassembled with fresh components with no issues once cable routing was decided. Pros: easy to setup and is very nice. looks great and is built like it looks. sturdy with elegance. Other Thoughts: if you need instructions on how to build a computer let me suggest that you have someone with a little knowledge do it for you. Pros: Looks clean, has decent sand dampening installed. Good filtration. Can't go wrong! Cons: Usual cheap case material I'd say, however, this isn't exactly a con at this price point as the server I built is quite light. Pros: Solid construction. Easy tool less HDD, SSD, Optical drive installation. Enough room behind mobo to tuck most cables away even with non modular power supply. lots of room in main chamber for any add in cards and cpu coolers. Doesn't have holes all over the place so it will keep the dust out. Very quiet as advertised! Cons: NO INSTRUCTION MANUAL! I nearly destroyed the front panel trying to remove it to install another front fan. I ended up breaking part of it and had to order a new front panel. You cannot remove the front panel with an optical drive installed. It must be removed to take it off. I learned this the hard way. Bottom removable magnetic dust filter feels very cheap and delicate and the magnets seem barely strong enough. I would rather see a slide in dust filter. If too much downward pressure is put on the plastic HDD cages, they risk falling from the slot they go in. In addition I couldn’t figure out a way to securely attach a HDD to the metal with any of the screws provided even with the plastic tray installed properly. All the screws provided appear too short. If your power supply has thick, round cables and sata power connectors that are spaced several inches apart, forget about trying to connect more than 2 HDD / SSD in the bottom cages. Other Thoughts: Its still a good case. but I expected higher quality inside parts for a case for this price and especially a manual and not just a parts list. 3 out of 11 people found this review helpful. Did you? Pros: Great build quality (except for front latch), good sound-proofing, looks fantastic. Front fan-speed switch seems shoddy (cheap plastic and switch quality), but it works. Good quality screwless drive mounts (easy to attach drives and mount/unmount). No sharp-edges. Cons: Front panel is plastic and bends, so when you close the panel only the latch your hand is closest to will actually latch - E.G. the top will latch but the bottom will just bend around the latch unless you press right on it. Case fans are only 3-pin so to control fan speed you have to plug them into toggle switch mounted to front of case that only gives you low-med-high - can't use motherboard to auto control case fan speed. PSU screws are not thumb-screws. Other Thoughts: Bottom mounted PSU but upside-down mounting means it draws air in from the case and not from the floor - which in my experience means a lot less dust sucked into the PSU. The center motherboard stand-off screw is not a screw - it's a peg. This is helpful in that it holds the motherboard in place against the pressure of the backplate when mounting, but since there's no screw-head it doesn't provides the proper grounding for that screw mount; this hasn't proven to be an issue but does seem strange.